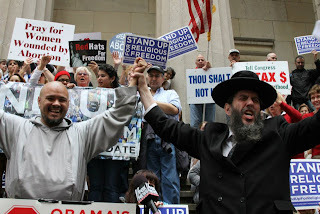 PressRelease- Rabbinical Alliance: Filibuster Defense Authorization; Boot Bostick | RabbiLevin.com - Fighting for Morality! RABBINICAL ALLIANCE OF AMERICA For Immediate Release: Sept. 20, ’10 Contact: Rabbi Yehuda Levin, Spokesman on Family Values: 718-469-6999 850 Rabbis Call On Senators Schumer and Gillibrand: 1. Tell Congress: Stop shoving the radical LGBT agenda down our throats – or else. 2. Hold hearings and fire Lt. Gen. Bostick from the Army.